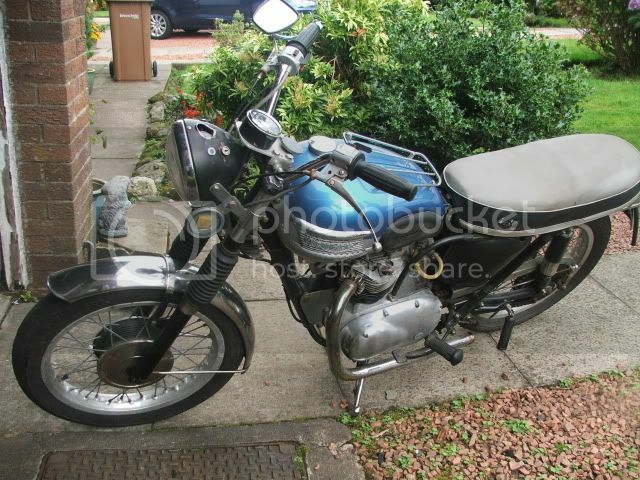 The bike covered 1500miles before his medical problems, so hopefully a wee bit of re-commissioning to get it up and running and MOT'd the try to get an Age related number for it. Last edited by jimmy on Sun Aug 26, 2012 8:07 pm, edited 1 time in total. Way to go jimmy, we could now race each other up the Loch Lomond road . I hope it has less oil leaks than my 500, as I get one fixed it seems to dribble out from somewhere else. I just returned from a 50 mile ride and enjoyed it immensely, nothing like the roar of a 360 degree parallel twin . Looks good that, all the hard work done too. Personally I would not bother with an ammeter now you have an alternator and 12v. They are wired as part of the ignition system and if a wire comes loose you have a baffling lack of sparks. It certainly has some worthwhile extras. I would be interested in your opinion of the f/brake when you get a chance to ride it. Mine, despite new shoes is totally pants and may need to have the drum skimmed and matched to over size linings. I can vouch for the VAPE (or Wassell) ignition unit, mine was easy to fit and seems to perform well. Alistair Lawrie - I remember someone of the same name having a very tasty Trident special featured in BIKE magazine years ago, is it the same guy?. Yea, it is the same guy. He used to sprint twin x twin engined Triumphs, as well as running Tridents, and developed a belt drive system to link the two engines. The ignition is Boyer Bransden, another + for hooli, eh . I contacted the TOMCC who confirmed, from the engine and frame number, that it is a 1959 5ta. So I will send off some pics and Â£5 to get the dating certificate so I can try and get an age related plate. Last edited by jimmy on Tue Aug 28, 2012 11:46 am, edited 1 time in total. Its a nice one. I like the 500 which is the only classic one I kept when I sold the 650's. Looks like you still have a bit to do as I see a missing tail light and the headlamp brackets. Nice to have that kind of work on the motor. Maybe I should bring mine up in a historical since as I just redid the fuel tank. Finally found some of my old photos from when I first brought it home, have to get them on photobucket. I had a 1959 5TA as a lad c. 1967. 864 AUC Where are you now? The front brake was mainly for decoration, certainly wasn't much use. 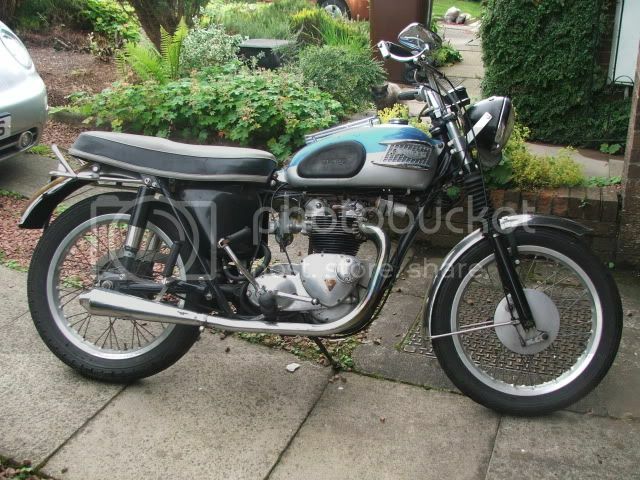 Had a habit of showing me the rear wheel if cornered with any enthusiasm - probably knackered swinging arm bearings? Always an easy starter, sweet motor, quite quick. Jimmy, you gonna post pictures of your progress? 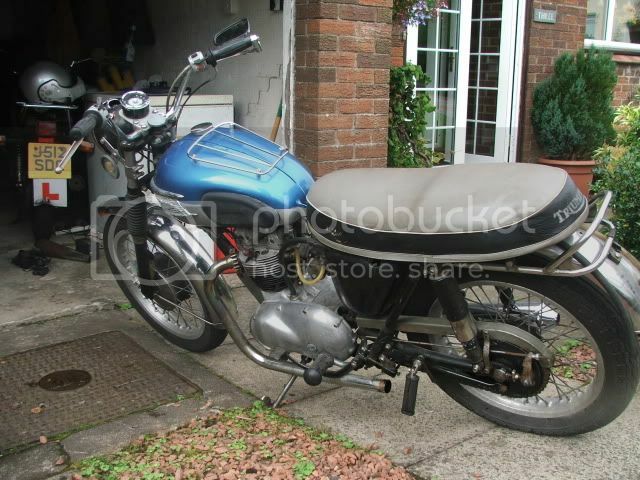 It is not my intention to do a full nut and bolt resto, but I will be changing the paint scheme and colour. I will clean the carb, change the oil and filter the hopefully run it a while to see what else needs doing, but yea I will post pics of anything changed or cleaned.